Ryan Teppen, a freshman insurance major and Gongaware Scholar at Indiana State University, has already heard a lot about networking. But he didn't fully realize the power of the connections he could create until listening to four professionals who owe at least a portion of their success in the insurance industry to the relationships they've built along the way. Teppen, along with other students from the ISU College of Business, attended the Insurance and Risk Management Alumni Panel on Thursday (March 19). Returning to ISU for the event were J. Michael Vaught, executive director of national sales and strategic relationships at Zurich North America; Maureen Biehl, vice president at Marsh USA; Tim Leman, chief growth officer at Gibson Insurance; and Charlie Gossett, an agent with Aflac. Biehl went to work for Marsh's Detroit claim group soon after graduating from ISU in 1998. She then worked for General Motors Corporation before rejoining Marsh in 2002. As a young professional, Biehl has relied heavily on the advice of mentors. She told students preparing to start their careers to take advantage of workplace mentorship programs or find someone they respect to emulate. "It's a good way to challenge yourself and grow," she said. Leman graduated in 1997 with a degree in insurance and risk management and in 2004 received ISU's GOLD (Graduate of the Last Decade) Award. He emphasized the importance of thanking those who have supported him throughout his career and keeping in contact with professors and classmates. "Keep in touch, let the people who have helped you along the way know about your successes," he said. Gossett, a 2001 graduate in criminology with a minor in insurance and risk management at ISU, tried out different careers before finding his niche in the insurance industry. 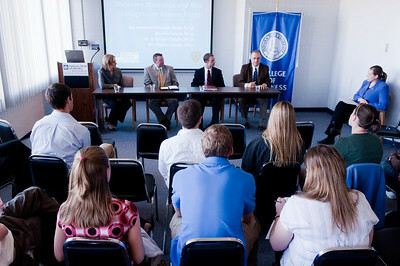 He encouraged current undergraduates to keep their options open as they look toward the future. "It doesn't matter what career path you take within the industry because there are so many different avenues," he said. "With insurance you can go anywhere you want to go." Gossett shared stories of helping people with insurance claims during trying times. "I enjoy actually seeing what I'm doing for my policy holders," he said. "That's what fuels my day-to-day drive." For Vaught, personal interaction is one of the best things about the insurance industry. A 1970 graduate of ISU and a member of the Insurance Advisory Council in the College of Business, Vaught now serves as a mentor to others and has an extensive network of professional contacts throughout the country. Yet he still remembers a piece of advice he received early in his career from someone who mentored him. "You can judge a person's character by how they treat someone who can do absolutely nothing for them," he said. "The most profound thing about our industry is that you can touch people. That is your legacy." The panelists stressed the importance of making connections early and finding ways to be remembered. "When you meet someone, make it personal," Biehl said. Teppen, who was able to meet the panelists during a reception before the event, plans to take Biehl's advice and send thank you notes to the participants. Though he's only a freshman, the Evansville native hopes to start implementing what he learned from the panelists right away. "A lot of the upperclassmen have been talking to me about networking and the panel really hit on that tonight," he said. "I learned from their stories that extra effort will pay off. It may not be fun or easy at the time, but you will reap the benefits." The alumni panel was sponsored by the ISU insurance and risk management program and Gamma Iota Sigma, the risk management, insurance and actuarial science collegiate fraternity at Indiana State. More information about the program and its activities is available online. Four graduates of the Insurance and Risk Management program returned to the ISU College of Business to share their success stories with the leaders of tomorrow.